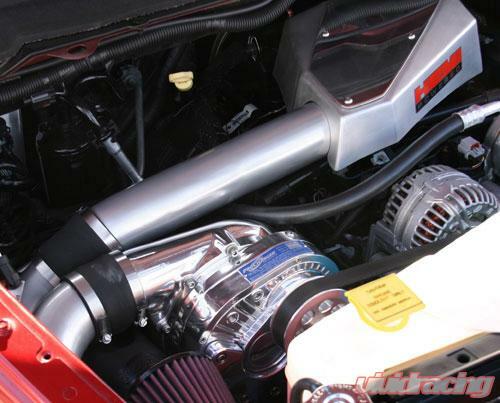 ATI is proud to announce its HO Intercooled ProCharger system for Dodge Hemi 5.7 Rams. The system produces 45-50% power gains on stock motors running pump gas with 6 psi of intercooled boost. Featuring the coolest charge air temperatures available, the ProCharged system delivers industry leading power gains and superior engine longevity. Industry exclusive features include a 3-core air-to-air intercooler system, and patented self-contained supercharger with 3-year warranty. The HO Intercooled ProCharger system is 100% complete, with supplemental injectors and programming to ensure maximum performance. ProCharger systems feature easy installation, minimal relocation of components, no need to punch a hole in the oil pan, and avoid having to deal with all the complexity of an air-to-water intercooler.